A new, easy-to-install, battery-operated kit that humanely stops horses from stall kicking to prevent injury, reduce farrier and veterinarian visits, and bring quiet back to the barn is being introduced by QuitKick USA of Westford, MA. The QuitKick Total Stall System humanely stops horse stall kicking behavior without human interaction by spraying two jets of water in one-second bursts after the horse kicks. 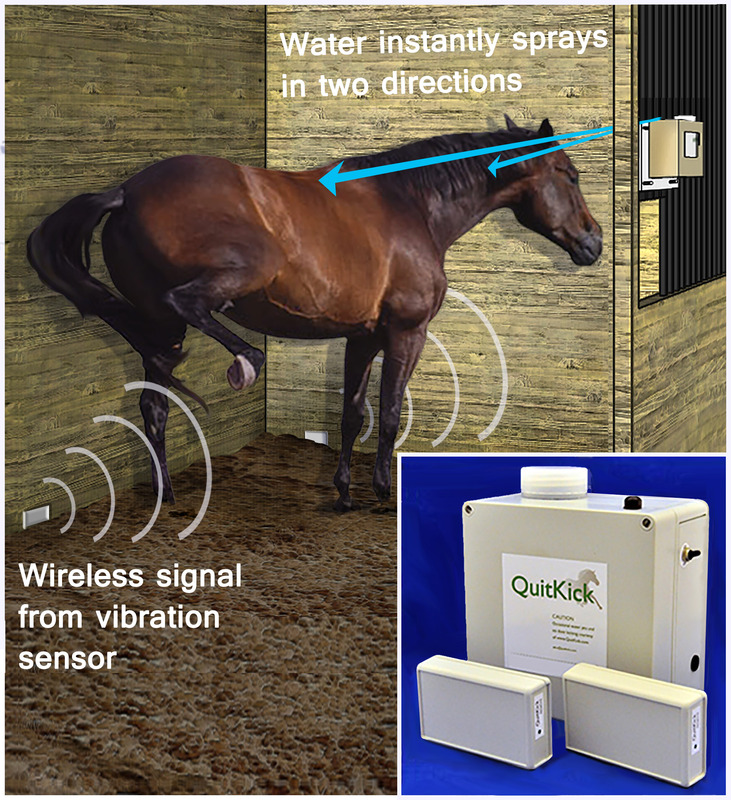 Featuring wireless sensors for mounting on the wall near where the horse usually kicks, and a main unit that mounts at the front of the stall; kicking instantly causes the horse to get sprayed and modifies the behavior because the water spray is associated with its own kicking. Since the QuitKick Total Stall System only activates when the horse kicks, continual use reinforces the horse’s new non-kick behavior. According to experts, owners should never reinforce kicking by providing food when the horse kicks. Easily transportable for travel to shows, the kit includes all mounting hardware, rechargeable batteries, and a battery charger. The QuitKick Total Stall System kit sells for $485.00 complete. Dealer inquiries are invited. Literature is available at www.quitkickusa.com.